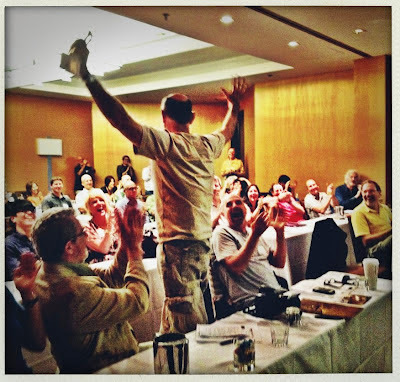 John Lund raises his trophy in celebration of winning "Smallest Sale of 2011" at the Blend Images Annual Spring Creative meeting. BTW, I am taking a risk here...I pulled this image from facebook without permission and not knowing who shot it! “Back in the day” the big agencies such as Getty and Corbis used to put on various events for their contributing photographers. It was always fun and informative and such events were always very well attended. It was great to get to know one’s fellow photographers, catch up on industry gossip, learn a few things and get a better handle on what was going on in the business of stock photography. Those big agencies don’t really do that anymore, but I just returned from the BlendImages annual creative meeting held in Palm Springs just prior to the Palm Springs Photo Festival. Now, keeping in mind that I am a Blend owner, I thought the event was fabulous! It was great to have speakers such as Matt Harrison, a motion director and UCLA Film Instructor who talked on directing talent, story boarding, and various other things motion, Don Picard (of TCP Insurance) who provided some eye-opening information on insurance (Don will be doing a series of blog guests posts on that very important topic soon), and Wilson Standish, a market researcher with Trendera (during Wilson’s presentation I was kept very busy scribbling down ideas). We also had both Canon and Nikon reps providing info on the latest cameras. Karen McHugh of Samy’s Camera in LA was there and ready and willing to answer all kinds of equipment questions. For most of us at Blend Images Karen is our go-to-person whether we have a mundane purchase to make or an emergency replacement need. She gets it done. Rick Becker-Leckrone, Blend CEO brought us up to date on the “State of Blend” and the industry in general, and Scott Redinger-Libolt (Blend editor), Jim Doherty (Senior Art Director), and Sarah Fix (VP Creative) helped lay out strategies for growth including the ins and outs of shooting RM, RF, and for TAC (The Agency Collection carried by both Getty and iStockphoto). Jasmine Hartsook (VP of Operations) and Stewart Cohen (Blend Photographer, and Co-Founder and film director) brought us up to speed on the Blend Motion Collection. Sarah Fix also provided a special little presentation on what content ISN’T selling and why…and I noticed that I had a few representative samples in that collection. Oh well…. Jon Feingersh (Blend photographer and co-founder) moderated a panel on “Investing In Stock During A Recession” that included Hill Street Studios (Blend photographer and co-founders Lawrence and Betty Manning), Mike Kemp (Blend contributing photographer), Jose Pelaez (Blend photographer and co-founder), Tom Grill (Blend photographer, co-founder and owner of Tetra Images) and John Fedele (Blend contributing photographer). We also had a panel (myself included) of shooters who have begun to shoot motion along with stills. Chris Gramly, Rick Gomez, Walter Hodges, Lawrence Manning and Eric Raptosh participated in that one. We had a silent auction of prints donated by Blend Photographers the proceeds of which went to the International Rescue Organization. There was ample time for mingling among shooters and staff as well as a sponsored cocktail party and such. My head was swimming by the end so I may have forgotten a thing or two, but suffice it to say it was a wonderful time full of information, fun and a huge sense of community. We even had two photographers come from as far away as Columbia! Oh yeah, among other things trophies were awarded for highest selling RM image (which made a $28,000.00 and an $11,000.00 sale), highest selling RF image, and the one I actually won…the lowest sale of 2011. Hey, it still felt good hoisting that trophy! Ok,Ok, my share of the sale was 4 cents. It was Rights Managed. With RM you can undercut anyone! BTW...a sale from the Getty site. I had just my smallest sale via AGE. 2,50 for me and 2,50 for AGE.